I came up with this one evening when R. and I arrived home hungry with nothing planned for dinner. It was made out of what was in the fridge and turned out to be really good. So last night I made it for friend who came over at the last minute for dinner. I asked him to grade it and he and R. both gave it a 4. “A 4?” I said. “That’s all?” They assured me that yes, it was really good but it wasn’t a 5. I tried to talk them into a 5, but they believed having a few 4’s on this blog would be fine. I know I told you I’d only post dinners that are a 5, but since I think it’s a 5, plus the absolute simplicity of it, I’m including it. 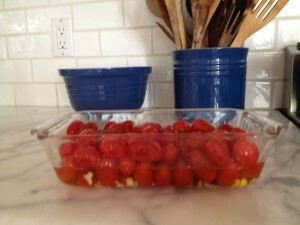 Roasted cherry tomatoes: (These are so useful and easy, they’re worth having on hand. I’m going to try freezing them and will let you know how that turns out.) Chop two large garlic cloves and place in an oven proof dish. Add a pound of cherry tomatoes (or cut up large tomatoes), salt and pepper to taste, and olive oil half way up the tomatoes. Cook pasta (I used whole wheat for this which makes me feel righteous and R. is slowly getting used to) with a T. of salt in the water. Drain and leave in the colander. 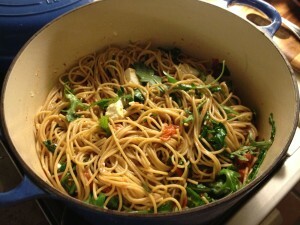 Add tomatoes and the olive oil they cooked in to the pasta pot. Slowly stir in a portion of the pasta and some of the greens until you get the consistency and balance you want (I like a lot of tomatoes and olive oil in mine and almost a whole package of greens – which will wilt as you add them.) Add the feta cut into medium size chunks. Reheat until the cheese melts. For me, having olive oil, garlic, pasta, some form of tomatoes, a lemon, something green and a bit of cheese are absolute necessities in my kitchen – you can always fix a meal. That’s funny. It was Rob who voted it a 4 last night! Hi Jenifer – Your one pot chicken penne sounds wonderful!